First, I would like to give thanks to God for the inspiration that allowed me to write this letter, which is also a speech, a presentation on television of my creed, of the things I believe in. I intend to live about 100 years more, so this is not farewell. 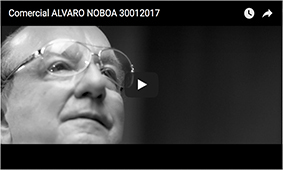 On the contrary, it is the beginning of a much more solid, richer, life, full of spirituality, continuing – as a friend of mine said: “Alvaro Noboa is the synonym of work” – continuing with the work, carrying on with the social work I started in 1978, for more than thirty years now, continuing my service to God, continuing raising my children, loving, loving my fellow man, loving humanity and developing my knowledge. I am going to, once again, read this to all of Ecuador and to those who so graciously replied to this public call I made, and so that those who think as I do come closer so we can realize our dream together. In what I believe… I believe in freedom and in those who fight for freedom. I think we are all equals before the law. I believe in justice and the independence of the courts. I think we all have a right to first class medical attention and universal health care. I think we all have the right to achieve happiness. I believe in one true God, full of love, who blesses us, who is merciful, who is always there to help, and believe in your salvation in Christ and that of all humanity. I think everyone should have the opportunity to be educated and to become, over time, technical, professional and modern businessmen. I believe in the brotherhood of blacks, whites, Chinese, Indians and mixed races. I believe in fighting to eradicate world poverty. I think there should be no class struggle; that we are all brothers and we must work together, united in a common goal. I believe in agriculture, industry, commerce, fishing, mining, tourism and all activities that generate jobs and production. I believe in having children or adopting children who have no parents. I think we should educate and protect children and young people, believe in the happiness they bring us and in the future they represent. I believe in change to achieve progress. I believe in the honour, dignity and honesty of the human being. I think we need to end corruption. I believe in social security. I think poor neighbourhoods must become first class neighbourhoods, with concrete houses, paved streets, potable water, electricity, sewers, safety and all basic services. I believe in private property and the right of all human beings to achieve, through their work and resourcefulness the production of wealth, the promotion of employment and the creation of businesses. I believe that schools, technical colleges and universities should be modern and equipped with computers, with all the modern technology and everything required for students to obtain the highest level of education to which they aspire. I believe in free enterprise, free trade and in the rights of the workers. I believe that employers, workers and government must work together towards one same mission: the production and the welfare of the producer and consumer. I believe that everyone, absolutely everyone, should be employed. I believe in ending crime. I believe we should speak our minds with freedom of speech. I believe in the left wing concept of social service and in the right wing ideas regarding production. I believe in a strong, rich, modern and civilized nation. I believe in the beauty of Nature and its protection. I believe in art and beauty. I believe in exercise, sport and physical maintenance. I believe in laughter and joy. I believe in ending poverty. I believe in living without fear. I believe in the growth of the human being. If you believe in one or more of the things in which I believe, follow me. Join me and together we’ll fight everyday to make our dreams a reality. The human being is composed of many facets, an artistic side, and this museum is a house of art; it incorporates a productive capacity, and the companies I work for are reflections of that human characteristic, that out of necessity and pleasure, out of the joy of working, out of the pleasure of producing, compels me to awaken every morning to work and lays me down at nights after a long day of work. The human being is also responsible for reproduction, and therefore we all have children and it is our responsibility to raise them, to prepare them, to give them that character they need in life to face a thousand dangers, and the thousand of attacks that we human beings all receive every day of our lives. Human beings are also intellectually curious, and have a need to educate themselves. Therefore, we donate computers to the poorest schools every day, and for which reason we educate ourselves whenever the opportunity presents itself, first in primary school, then in high school, then at university. And among those here present today, Vicente Taiano Jr. is very proud to have a master degree and a Ph.D. at his young age; many here also have two professions or more. The human being also has a commitment to nature and so it is his responsibility to protect the ecosystem, it is her responsibility to care for the beauty that is Nature, and to care for the fields, the factories, the businesses that generate the opportunities we require to grow, improve and survive. The human being is also a spiritual being, so I firmly believe in God, a faith that was given to me by grace, and that makes me believe Christ died on the cross for us, rose again on the third day, and that today is in the Kingdom of Heaven. The human being is also a political being, organized both economically and politically. For that reason the PRIAN exists as a political formation in our country: to defend those freedoms that need defending, without regard for the attacks we receive in defending these freedoms, without regard for the blackmail or the number of offers we receive to stop upholding these freedoms. The human being requires justice, for that reason the independence of the courts is vital. Human beings need to forgive, because in the words of the Our Father is the forgiveness of man, but there is also the need for humans to forgive when we have been hurt or when we have been attacked. Humans need hope, because only hope keeps us walking towards the greater light, looking for a better place for us and our children. Human beings require progress, because it is intellectual progress, physical progress and personal improvement that day by day draws us closer to God. The human being requires all kinds of resources to help others, therefore, for over thirty years now, the Crusade for a New Humanity, has been searching for social solutions to those in need. Human beings have to eradicate poverty because is an ancient scourge that must end with the twenty-first century. Poverty is the biggest scourge against humanity and is my biggest fight, the fight against poverty. Humans need love, because love is the greatest expression of spirituality, Christ was love, Christ is love, Christ will be love and you, and all God’s children, are beings of love. Human beings need to free themselves from fear, because fear is bad faith, it is doubt of victory, it is to question God’s protection, and it is the doubt of everything that is good and all the good that can happen. Let’s face life with faith, hope and determination, and continue moving forward together.